It’s cold outside, Ideas for winter fun! Here at SupportPay we get lots of questions regarding child support. Here are our list of the top eight myths surrounding child support payments and how SupportPay can help manage the financial part so you can focus on raising happy kids. 1. If parents have joint custody, nobody pays child support. There are certainly instances where this can be true however, in most cases, one parent will pay some form of child support. Child support is supposed to help both parents bear the financial responsibility equally. So even when parents share joint custody, the kids are often with one parent more than the other. 2. Child support payments are tax deductible. Child support payments actually have no effect on income taxes. The paying parent doesn’t get to deduct payments and the receiving parent doesn’t have to include them in income. Child support payments also do not directly affect the dependent exemption deduction. That typically goes to the custodial parent, but is handled separately from child support payments. 3. Child support stops at age 18. There was a time when this was true, but recent changes in laws concerning child support have made this a thing of the past. The rules are a lot more convoluted now. Child support continues after age 18 in certain instances, such as when the child is still attending high school upon turning 18. 4. If my ex-spouse owes me child support, I can’t collect after my kids turn 18. Most states don’t have a statute of limitations where child support is concerned. This means that often times, you can collect back child support even after your kids are grown and moved out. 5. Child support payments are determined by the court when finalizing a divorce and remain the same until child support stops. 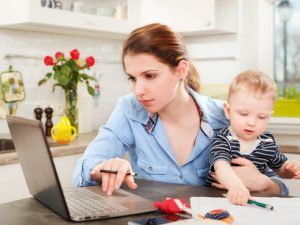 There are a number of reasons why child support payments can be increased or decreased, including change in income for either parent, loss of job by the paying parent, or a drastic change in the needs of the children. 6. Child support payments can only be spent directly on the kids. Child support payments may be used for indirect support of the kids, including housing, health insurance, and other expenses. 7. I have a right to know how my child support money is being spent. Although it’s a nice gesture, there is no legal responsibility on the part of the parent receiving child support to report back to the paying parent on where the money was spent. If the paying parent believes the child support money is being improperly used, the paying parent can ask for a child support payment modification. 8. If the paying parent quits his/her job on purpose, child support payments will be lowered because he/she doesn’t have the ability to pay child support. If the paying parent quits his/her job to avoid child support, the courts will recognize this aversion tactic and not decrease the child support payment due. The court reasons that both parents have a responsibility to financially support the children and choosing to be unemployed to avoid paying is not a good excuse.